Belgian financier and philanthropist; born at Mayence in 1808; died at Brussels Feb. 6, 1883. He left his native town when quite young and went to Belgium. Endowed with good judgment, being a tireless worker, and having early become familiar with business operations, he was soon engaged in important financial transactions, in which his mere name and his experience inspired the public with confidence. He opened a bank at Antwerp and another at Brussels, both of which rapidly succeeded. 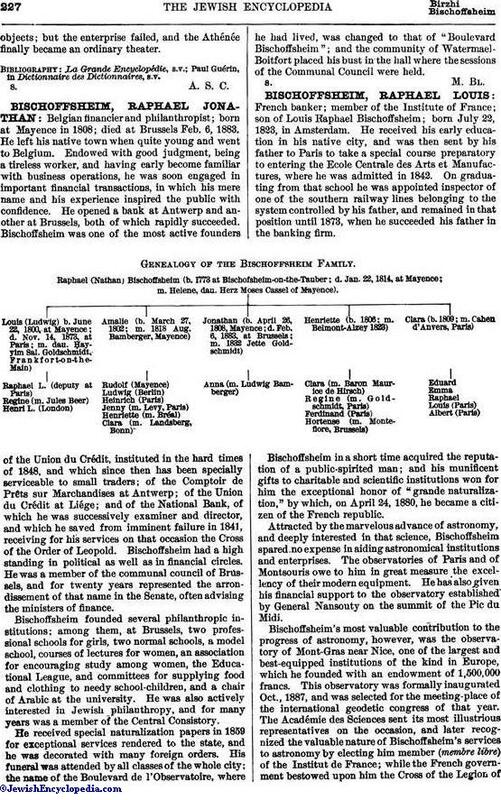 Bischoffsheim was one of the most active founders of the Union du Crédit, instituted in the hard times of 1848, and which since then has been specially serviceable to small traders; of the Comptoir de Prêts sur Marchandises at Antwerp; of the Union du Crédit at Liége; and of the National Bank, of which he was successively examiner and director, and which he saved from imminent failure in 1841, receiving for his services on that occasion the Cross of the Order of Leopold. Bischoffsheim had a high standing in political as well as in financial circles. He was a member of the communal council of Brussels, and for twenty years represented the arron-dissement of that name in the Senate, often advising the ministers of finance. Bischoffsheim founded several philanthropic institutions; among them, at Brussels, two professional schools for girls, two normal schools, a model school, courses of lectures for women, an association for encouraging study among women, the Educational League, and committees for supplying food and clothing to needy school-children, and a chair of Arabic at the university. He was also actively interested in Jewish philanthropy, and for many years was a member of the Central Consistory. He received special naturalization papers in 1859 for exceptional services rendered to the state, and he was decorated with many foreign orders. His funeral was attended by all classes of the whole city; the name of the Boulevard de l'Observatoire, where he had lived, was changed to that of "Boulevard Bischoffsheim"; and the community of Watermael-Boitfort placed his bust in the hall where the sessions of the Communal Council were held.